Use the search function (link at the bottom of this page) to select a suitable performance injector and injector accessories from the Raceworks range for your application. Power figures which have been quoted are to be used as a guide only. For naturally aspirated vehicles running a base fuel pressure of 3bar, they are fairly accurate. For naturally aspirated vehicles running a base pressure of 4bar, add a further 10% to the power figures quoted. For forced inducted vehicles, power figures quoted are based off a fixed fuel pressure of 3bar, therefore in reality, the injectors will support more power, as fuel pressure increases with manifold pressure, allowing the injectors to flow more than has what been accounted for in these calculations. In these instances, we recommend you add a further 10% to the power figures quoted for every bar of pressure the fuel system will flow at above 3bar. Figures stated are what the injectors will support, NOT what your vehicle will make by upgrading to these injectors. Raceworks will not be held responsible if your injectors are unable to support the power stated. For more information it is recommended that you discuss with your tuner. Note there are exceptions to this, such as Toyota MR2 which is rear engine/rear wheel drive, and a loss of 15% has been used in the calculations. Where extended nose injectors have been used in a particular vehicle from factory, only extended nose injectors have been recommended as replacement, and extended nose injectors have only been recommended for these applications, even though they can be used in many applications that run standard nozzle injectors from factory. 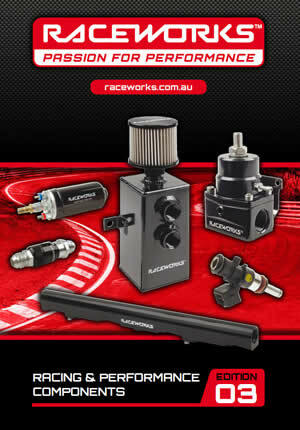 All Raceworks injectors are High Impedance, and can be used in both low and high impedance configurations. Note when installing onto a vehicle that has low impedance injectors from factory, it is recommended that resistor packs are disconnected/bypassed. Again, consult your tuner/engine builder. Should you have an engine that is not listed here and would like info on the compatibility of Raceworks injectors, please contact your nearest stockist.